IN the wake of the NSW Government’s Strategic Regional Land Use Policy, comes an offer to renew 22 of the state’s coal seam gas (CSG) exploration licences, including four in the Illawarra. The licences cover more than five million hectares in NSW, including in areas of the Illawarra escarpment’s water catchment area. The freeze on fracking was also lifted. Stop CSG Illawarra spokesperson, Jess Moore said the state government has given the green light to CSG in NSW. “All exploration licences in the Illawarra have been renewed, including one in the drinking water catchment,” she said. “Communities have made it clear that science must come before development, and that land and water must be protected. Instead, fracking’s back on and exploration across five million hectares in NSW has been renewed. 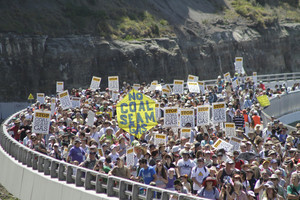 “(Premier Barry) O’Farrell promised to ban exploration and mining in the drinking water catchment. This was – quite clearly – a lie. “Dressed up in words like ‘protection’ these changes are nothing short of betrayal. They put land, water and communities at risk. State MP for Heathcote Lee Evans said the NSW Government has introduced stringent controls to address community concerns about environmental standards for coal seam gas exploration and production. “In Opposition, we committed to reviewing gas well construction and hydraulic fracturing regulations to ensure that rigorous standards are in place following 16 long years of Labor inaction,” Mr Evans said. “The development and release of these two codes of practice delivers on that election commitment and makes sure licence holders are both aware of and adhering to the high standards expected of them. “All coal seam gas exploration and production titles will be subject to the new codes of practice, which will also be included as a condition of title. “Failure to comply with title conditions can result in enforcement action against the title holder, including prosecution and title cancellation.